President Obama Rejects Keystone XL Pipeline Plan : The Two-Way "Shipping dirtier crude oil into our country would not increase America's energy security," the president said in a statement delivered at the White House. 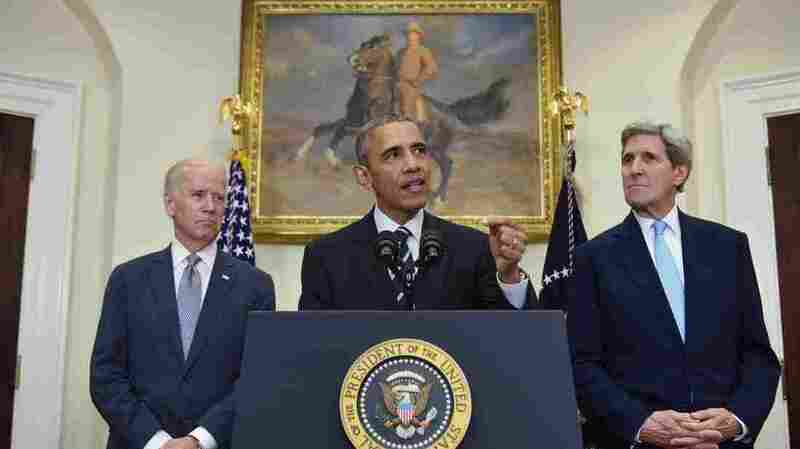 President Obama, flanked by Secretary of State John Kerry (right) and Vice President Joe Biden, announced the Keystone XL pipeline decision Friday in the Roosevelt Room of the White House. Ending a process that has lingered for much of his time in the Oval Office, President Obama announced Friday that the U.S. has rejected TransCanada's application for a permit to complete the Keystone XL pipeline. The president said that "after extensive public outreach" and consultations, the State Department determined that the proposal "would not serve the national interests of the United States." He added, "I agree with that decision." Back in February, Obama vetoed congressional legislation that approved the project. The Senate failed to override that veto in March. The first application for approval of TransCanada's plan was filed in September of 2008. After the formal rejection was announced, TransCanada issued a statement saying it's reviewing the U.S. administration's reasons for denying the permit, and that it might reapply. We've updated this post with today's news. Saying he's "disappointed" with the U.S. decision, Canadian Prime Minister Justin Trudeau adds, "The Canada-U.S. relationship is much bigger than any one project, and I look forward to a fresh start with President Obama to strengthen our remarkable ties in a spirit of friendship and cooperation." Trudeau, who won his leadership post last month, added that his government "will work hand-in-hand with provinces, territories and like-minded countries to combat climate change, adapt to its impacts and create the clean jobs of tomorrow." Obama made the announcement in the White House's Roosevelt Room, alongside Vice President Joe Biden and Secretary of State John Kerry, whose agency has been conducting a review of the project for more than seven years. The statement came shortly after Obama and Kerry met privately Friday morning. In rejecting the proposal, Obama said the Keystone debate has played an "overinflated role in our political discourse" — something for which he blamed both parties. The president also disagreed with what he described as critics' claims that the completed pipeline would be "the express lane to climate disaster." Discounting Keystone supporters' claims that the pipeline would boost the U.S. economy, Obama later added, "Shipping dirtier crude oil into our country would not increase America's energy security." Obama also said that American industries have moved quickly to adopt renewable energy. "Today, the United States of America is leading on climate change," he said, citing gains in efficiency and environmental protections. "Ultimately, if we're going to prevent large parts of this Earth from becoming not only inhospitable but uninhabitable in our lifetimes, we're going to have to keep some fossil fuels in the ground rather than burn them and release more dangerous pollution into the sky," Obama said. TransCanada says that despite the permit rejection, the company is reviewing its options — including the possibility that it will file a new application for a cross-border pipeline. "TransCanada and its shippers remain absolutely committed to building this important energy infrastructure project," said Russ Girling, the company's president and CEO. Reacting to the news, Natural Resources Defense Council President Rhea Suh called Obama's rejection of the permit "a courageous leap forward in the climate fight." She added that the pipeline extension "would have locked in, for a generation or more, massive development of among the dirtiest fuels on the planet — posing a serious threat to our air, land, water and climate." Bill McKibben, co-founder of the group 350.org, said the move gives Obama "new stature as an environmental leader, and it eloquently confirms the five years and millions of hours of work that people of every kind put into this fight." McKibben added: "We're still awfully sad about Keystone south and are well aware that the next president could undo all this, but this is a day of celebration." Speaking out against the decision, American Petroleum Institute President and CEO Jack Gerard said, "It's ironic that the administration would strike a deal to allow Iranian crude onto the global market while refusing to give our closest ally, Canada, access to U.S. refineries." Calling the permit denial "politics at its worst," Gerard added, "the White House has placed political calculations above sound science. Seven years of review have determined the project is safe and environmentally sound, yet the administration has turned its back on Canada with this decision, and on U.S. energy security as well." The official rejection, which had been rumored for days, comes after TransCanada on Tuesday asked the State Department to suspend its review of its permit application, citing ongoing debate over its route in Nebraska. Plans for the pipeline had called for it to stretch from Alberta, Canada, to the Gulf of Mexico. Hundreds of miles of the projected route have already been completed. As NPR's Jeff Brady reported this week, the Keystone project became a target for activists and others who want new energy policies to focus on renewable energy instead of fossil fuels. Jeff added, "A big reason environmentalists don't like the Keystone XL is because of the oil it would transport. Much of it would come from Alberta's oil sands, which have to be mined. Then the gunky mixture has to be processed before it's usable. That emits more pollution than traditional methods of oil production."